It’s deep into the second semester for USC School of Cinematic Arts students. After long nights of editing, studying, writing and designing, the ability to keep moving forward can feel like a daunting task. In Ken Wannberg Endowed Chair for Music Editing Professor Ken Hall’s "Directing the Composer" on February 23rd, former Notre Dame football player Daniel “Rudy” Ruettigger, an icon of motivation and effort, visited the students for a pep talk. Rudy spent the morning before the class touring the facilities and visiting with faculty. 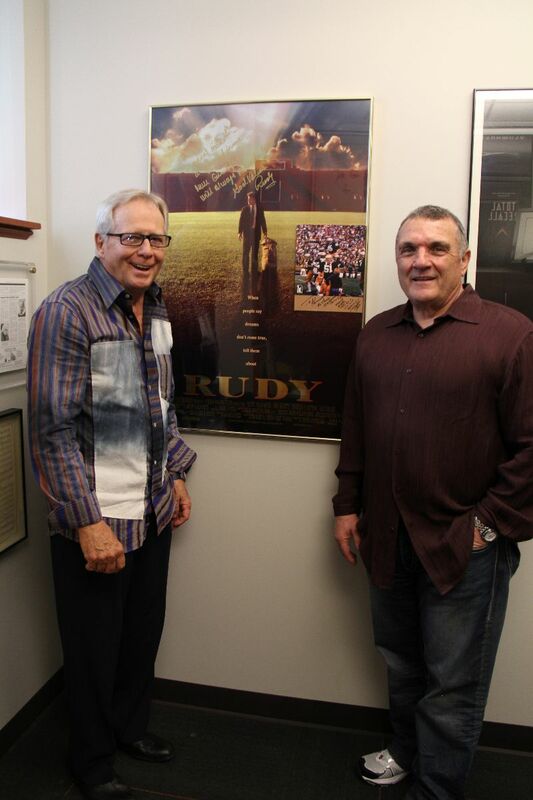 He stopped for a photo in Hall’s office with a poster for the film Rudy, which Hall music edited. With Ruetigger’s encouraging words, these students can take this motivation and tackle the second half of the semester with a revitalized outlook.